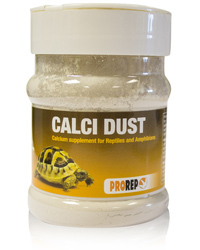 ProRep Calci Dust is a supplement for reptiles and amphibians. It is made from 100% natural calcium carbonate with no additives and is an excellent way to provide essential calcium and avoid deficiency diseases. It's micro-fine particle size ensures excellent adhesion to both live insects and plant material. Calcium forms an essential part of the diet of all reptiles and amphibians. Many foods that are used to feed them in captivity are low in this essential mineral or may have high levels of Phosphorus, which can inhibit the uptake of calcium. To supplement vegetable matter for tortoises and other herbivorous reptiles simply sprinkle over food immediately before feeding. To supplement insects then place a small amount in a plastic bag with the insects and shake gently. They should then be fed immediately while the Calci Dust is still stuck to the insects. To aid feeding the insects can be cooled before applying the Calci Dust. This will make them slower and ensure that they are quickly eaten. It is not possible to overdose using Calci Dust and it can be used to supplement at every feed. However, as some animals find large quantities of it unpalatable avoid smothering the food. Because this product is 100% calcium carbonate, large quantities are not required to provide adequate calcium levels. If acceptance is a problem then start with very low levels of supplementation and gradually increase it until your animals are used to the taste. Most reptiles and amphibians can only absorb calcium from their food in the presence of vitamin D3. It is essential that adequate UVB light of the correct wavelength and intensity is provided to enable D3 synthesis by the animal or that oral D3 is supplied. It is recommended that a vitamin/mineral supplement is also used in conjunction with Calci Dust. Precautions: Not for human consumption.